Orlando, FL is located approximately 232 miles (373 km) North of Miami, FL. 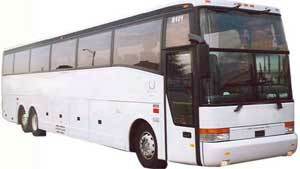 Miami Beach 411 specializes in Orlando from Miami transportation. We provide daily coach service to and from Orlando, Miami, South Beach, Miami Beach, Downtown Miami, near Miami Airport, Kendall, Hialeah, Hollywood, Fort Lauderdale, Boca Raton, and West Palm Beach. All Hotels from 6 to 27 St.
All Hotels from 28 to 87 St.
All Hotels from 88 to 192 St.
* Extra Charge waived if booking Orlando 1-Day or Multi-Day Trip. Operates in a 60 Passenger Bus with movies onboard. Hotels between 192nd & 6th St. Operates in a 14-Passenger Van or 33-passenger Mini-Bus. Reservations cancelled within 48 hours of scheduled trip incur 100% cancel penalty. If booking within the 48 hour cancellation period, all sales are final. Infants are free if they are held on your lap. As we are a booking website for contracted bus lines, you agree to hold us harmless for actions by others and our sole liability is limited to a refund of the monies paid us. The bus line reserves the right to substitute equipment based on operational needs. Important: The bus sells out during high season. Please buy tickets at least 2 days in advance. Where does the bus pick us up? Daily Bus: Free pick up is available from Kendall, Hialeah, Miami International Airport, Downtown Miami, South Beach, Miami Beach, North Beach, Hollywood, Fort Lauderdale / Boca Raton, West Palm Beach. Express Van: Pick up is available from Miami International Airport, Downtown Miami, South Beach, Miami Beach, North Beach, Hollywood, Fort Lauderdale / Boca Raton, West Palm Beach. Yes. The bus sells out often and only stops where it is scheduled to stop. Book online or call us at 1-(305) 754-2206. Is there a one way bus back from Orlando to Miami? Yes, we offer daily service from Orlando to Miami. The bus departs the Orlando Bus Terminal at 7pm everyday and 7am on Fri, Sat & Sun. The terminal is located at 5163 International Dr.(next to McDonald's & Perfumeland). What time does the bus depart Miami? Daily Bus: Departure time from Miami Beach is 6am. For other areas, see the Orlando from Miami bus schedule above. Express Van: Departure time from Miami Beach is 3pm. For other areas, see the Orlando from Miami bus schedule above. What time will we arrive in Orlando? Daily Bus: You arrive in Orlando at 11:15am. The extension to Disney World departs at 11:30am, and you arrive at the Park before 12pm. Express Van: You arrive in Orlando at 8:15pm. Extensions to Universal Studios or a Disney Resort are available for an additional charge. What time will the bus pick us up to go back to Miami? Daily Bus: 7pm from the Orlando Terminal, located at 5163 International Dr.(next to McDonald's & Perfumeland). Express Van: 7am from the Orlando Terminal on Fridays, Saturdays and Sundays. What time will we arrive back in Miami? Daily Bus: You arrive back in Miami at 10:30pm and start the drop off to all hotels. Express Van: You arrive back in Miami at 10:45am and start the drop off to all hotels. Why are the tickets so cheap? Orlando is the most popular vacation destination in the U.S. Bus tickets do sell out. Please buy your tickets at least 2 days in advance. Is there a bus that goes from Orlando to Miami? Yes, we provide service 7 days a week, with stops in Pompano, Fort Lauderdale, and South Beach. Click here for the Orlando to Miami bus. ABOVE: The actual bus - a 60 passenger luxury motor coach with movies onboard.